Best known for their New Year’s Day Polar Bear Plunge, the Coney Island Polar Bear Club actually goes for a dip in the Atlantic every Sunday at 1pm from November through April. Today, November 3rd, is the first swim of the 2013-2014 season for the country’s oldest winter bathing club, founded in 1903 by Bernarr Macfadden. In this video by Polar Bear Capri Djatiasmoro, taken on April 28, 2013, the final cold water swim of last season, the Bears “circle up” at the ten minute mark. The water temp was 50F / 10C. Want to join them? For the 2013-2014 season, the Coney Island Polar Bears are accepting 10 applicants for membership chosen by lottery. To register for the lottery, you must sign up here and will be notified of the results by November 9th. Selected applicants are required to pay a $25 application fee (non-refundable), participate in 12 swims within a single season between November and April and be voted in by a majority of the membership. The club has approximately 150 full-time members with about 100 coming out for weekly swims. Here’s another vid, also by Polar Bear Capri Djatiasmoro, of the group walking to the water on a cold day in January. Can you say camaraderie? You can also join the Coney Polar Bear Club for one guest swim. Just show up at the Bears “Clubhouse” at the Aquarium’s Education Hall on the Coney Island Boardwalk at West 8th Street by 12:30 pm with your bathing suit, a towel, surf boots or an extra pair of sneakers, and some warm clothing. Membership is not required for the January 1st Polar Bear Plunge, a fundraiser for Camp Sunshine and local charities. Besides being a great way to start off the new year, the event raises more than $20,000 annually for Camp Sunshine, a retreat for children with life threatening diseases. This short film produced by Coney Island Polar Bear Club member Jim Muscarella celebrates the joyous spirit of the club’s annual New Year’s Day swim. This year, sunny skies and temps in the 50s drew the largest number of participants in the club’s history. 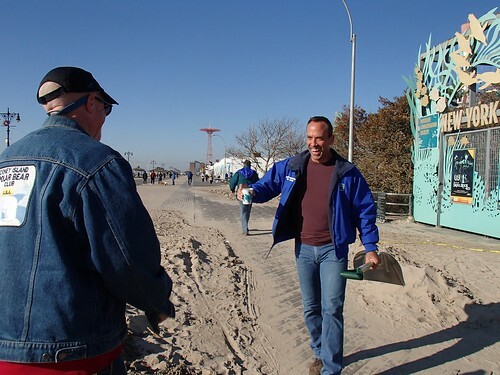 But the coldest thing on Coney Island, according to Muscarella’s film, is going for a winter swim when air temps are 10 degrees and under and water temps are under 35 degrees. Brrr! Well, maybe next year–it’s February and temps are still in the 40s and 50s.